Anytime there’s a natural disaster, emergency preparedness is all anyone can think about. But soon after the news coverage fades away,it’s back to the same old grind, with little brain power paid to wildfires, hurricanes, tornadoes and their ilk. 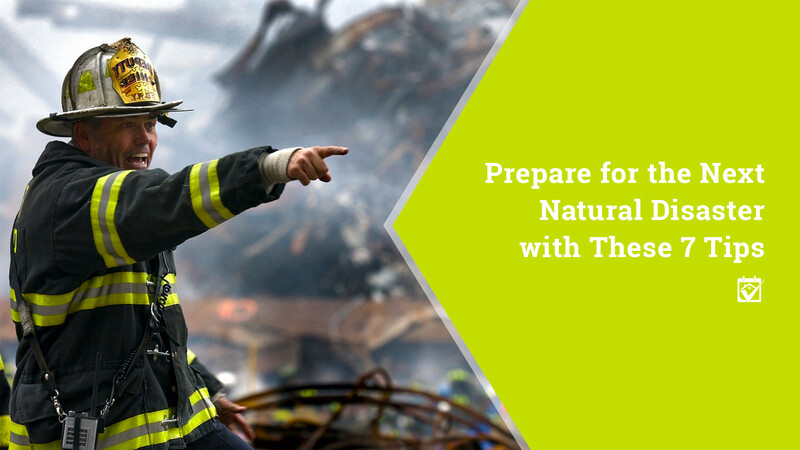 The truth is that natural disasters happen when they will and waiting until the last minute to be ready for one is a dangerous practice.Instead of that, you can be truly well-prepared for the next emergency situation. #1.Understand your local disasters. Even if you’ve lived in the same area all your life, there’s probably something you could learn about local disasters and their patterns.For example, you may know that a tornado means duck and cover in the hallway, but do you know if you should evacuate your home when an EF3 tornado is coming your way? Ready.gov has a library of information on emergency preparedness, including how to manage many different types of natural disasters. #3.Know who to contact before, during and after the event. Long before trouble pokes its head up, get a list of phone numbers together. These should be organized neatly and put in a place that’s easy to get to in case you have to grab them on the go. Numbers for a pet sitter, your child’s school, your spouse’s workplace and soon so help connect you with your loved ones before a predictable disaster. #4.Have an emergency plan that includes your pets. You need an emergency plan that the whole family knows. It should include what type of disaster you’re preparing for, the steps you should take, what items need to be involved and how pets and small children will be handled. Obviously, you can’t plan for every outcome, but if you include the most common natural disasters for your area, it’s a good place to start. #5.Practice your disaster plans monthly. No matter how well you may think you know your disaster plans, in the moment you may well freeze or forget something. That’s why practice is so important when it comes to preparing for these incidents.Determine how much time you have to get to safety, then time yourself with the goal of cutting the time down without missing anything on the list. #6.Keep a stock of supplies. Even if you feel a little silly doing it, keep an emergency supply cabinet stocked. You don’t need several months’ worth of food and water,but enough to get you by for a couple of weeks will be absolutely valuable. Check expiration dates frequently, rotating out food that’s about to go bad and replacing it with food that has plenty of life left in it. While you’re at it, don’t forget to stock some lumber and fasteners. That way, you won’t have to fight the crowds at the home improvement stores in days following a natural disaster. #7.Have an emergency fund. Even if you just put $10 a month into it, keeping an emergency fund in cash can help you make it through any disaster, even if credit card readers are down. Since epic disasters don’t occur every day, you have time to save, but you need to start as soon as possible to have plenty put away for that extra rainy day. It feels like things will never be the same after a natural disaster,but you’ll get by with a little help from your friends and your real estate team. Check out the contractors your Realtor has recommended to help get everything set right again and then give them a call. When you’ve got so much to clean up, it’s nice to know you have home pros that you can trust to do the job right.